Bitcoin is attempting to break the $6800 resistance following a run in the whole cryptocurrency market over the last 24 hours. Bitcoin is now worth $6735, gaining close to 6%. 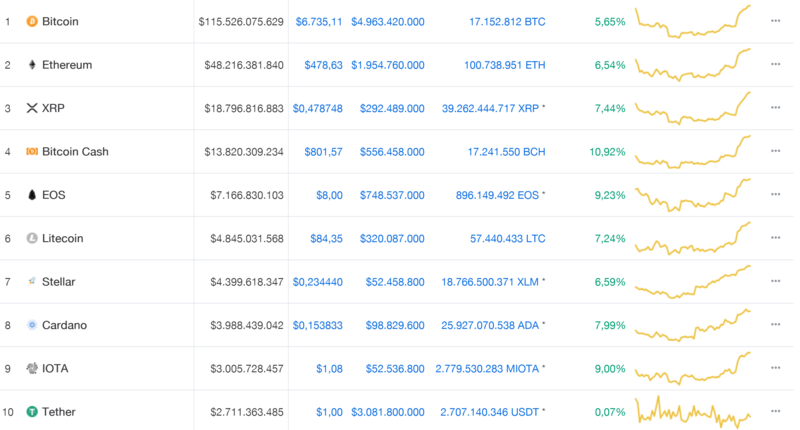 Ethereum and Ripple are following the same pattern with gains of 6,55% and 7,5%, but the real winners are most of the other projects in the top 10. EOS, Cardano and IOTA are all over 8% in green, with Bitcoin Cash having gains of 11% over the last day. Other well-performing projects are NEO (11,4%) and Monero (11,2%). Less than 24 hours ago the cryptocurrency market was still valued at $255 billion, now it is worth over $272 billion, a growth of more than $17 billion. It seems that the market is reacting to positive news on institutions stepping in. The largest asset manager BlackRock Inc announced they have formed a team to look into cryptocurrency and blockchain, billionaire investor Steven Cohen is joining a crypto hedge fund and today, Coinbase acquired licenses that allow them to operate as a broker dealer, ETS and RIA. TenX (up over 50%), Power Ledger (21%), Loom Network (21%) and Dogecoin (20%) are among the biggest winners in the top 100 today. Dogecoin got listed on Robinhood Crypto recently. Not a single project in the top 100 is in red. VeChain has recovered slightly from the sudden plummet and is now trading at $1,91. Will Bitcoin break $6800 soon?